The latest film with that title, adapted from a novel with the same name by Meg Wolitzer, is a classic drama about roles in a marriage, which were more delineated in the era the featured couple was married… the late 1950s. This plays out, in flashback and the present, as the husband wins the Nobel Prize for literature. And in this case, the wife is in the background, but as the story develops there are certain truths that have defined their marriage, and those unburied facts unearth counterproductive feelings as the ceremony swirls around them. All couples have secrets, but some secrets smolder so long that when they emerge they are explosive and damaging. This is one such story, but it comes with several twists. This absorbing narrative is fascinating (and universal) and the film is a Must See, especially if literature is your bag. 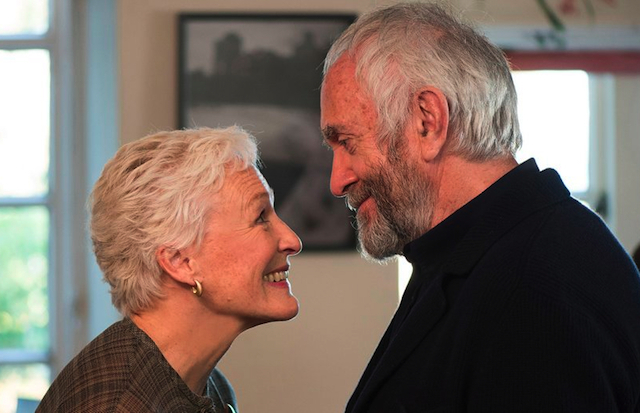 Glenn Close is Joan, the dutiful wife of Joe (Jonathan Pryce), who has just been awarded the Nobel Prize for literature. They travel to Stockholm for the awards ceremony with their son David (Max Irons), an aspiring writer looking for his father’s approval. There is a simmering resentment within the group, egged on by an outsider named Nathaniel (Christian Slater), a writer who is trying to be Joe’s biographer. As the interactions occur, there are flashbacks to the early days of the couple’s courtship and marriage, when the supportive wife and fledgling writer tried to navigate the competitive (and male) world of publishing. Joe is shown to be impulsive, negative and quick-to-give-up, but it is Joan who pushes him over the finish line. Back in the present day, it is Joan that also has to suffer the burden of those early days as her husband collects literature’s top prize. 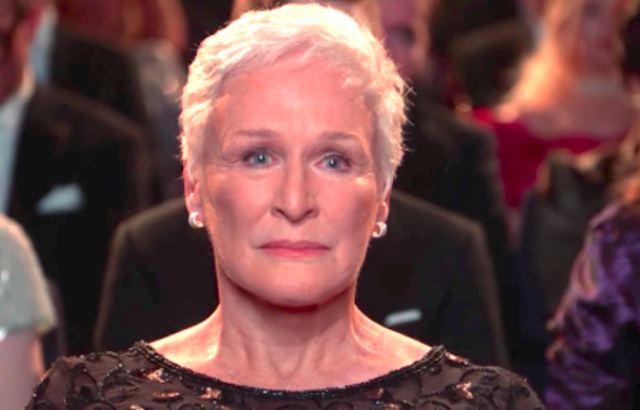 The film is anchored by Glenn Close as Joan, and her restrained performance is a marvel to witness. After doing time on stage and in the TV series “Damages,” Close has been coming back slowly through independent film, and this one is perfectly suited to her low burn persona. She developed a great chemistry with Jonathan Pryce, who roughed up his looks a bit to become the eccentric writer, and their interplay as a couple with secrets is both authentic and cringe worthy. The screenplay, adapted by Jane Anderson from a source novel also written by a woman, had that particular feel to it that is female in nature. There is an extraordinary scene from the past, where a brittle and burnt-out woman author (portrayed precisely by Elizabeth McGovern) demonstrates a sound that cuts straight to the heart of Joan’s circumstance. The social history of a “woman’s place” at that time in history is righteously revealed, which goes back to the bad luck of time/place birth. Also impressive is the structure that director Björn Runge brought to Anderson’s script. The story is generated step by step, and reveal upon reveal. The Christian Slater character is a catalyst for this intrigue, and Slater’s slick and oily writer role – there is an impression he is a bit of a hack – is a welcome addition to the pomp of the Nobel ceremony. Runge also throws a bit of operatic atmosphere in a key scene, choosing to allow snow to fall in wintry Stockholm just at the right time. The pleasure of this film is experiencing the performances – all so true – and the hallway of mirrors that the characters dared to go, creating the empathy for the couple’s story. Eventually it is the story of all of us, behind our own veils, while in the end it’s all a enormous gag.